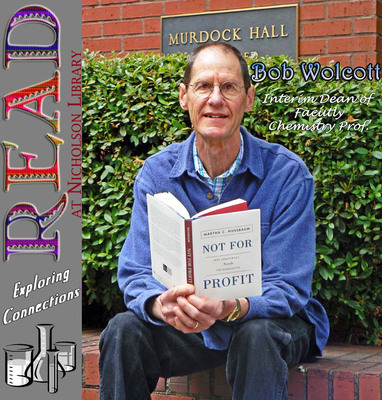 Bob Wolcott, Interim Vice President for Academic Affairs/Dean of Faculty and Professor of Chemistry, reading Not for Profit: Why Democracy Needs the Humanities, by Martha C. Nussbaum. Terry, Paula and Nicholson Library Staff, "Bob Wolcott READ Poster" (2010). READ Poster Gallery. Image. Submission 67.